Has an easy-to-read LCD panel with flow and salt level indicators. The Jandy AquaPure Ei (APURE35) is a wonderful salt chlorine generator that’s been designed for fast installation and ease-of-use. It only takes around 15 minutes to setup and then you can jump in your swimming pool and enjoy soft, silky water, free of the irritating and harmful effects of conventional chlorine. In this article we explain everything you need to know about saltwater pools, how they work and why they are superior to traditional chlorine systems, and we provide a full review of the Jandy AquaPure so you can decide if it’s the product for you. If you own a swimming pool an automatic chlorinator is absolutely essential — and healthier. We are all used to the traditional fresh water swimming pools but did you know that the concept of salt water swimming pools also exists? In the past few years, we have seen an increase in the number of saltwater swimming pools. In fact, a growing number of pool owners have chosen to switch from using a chlorine pool to a saltwater pool. This is because saltwater swimming pools have both economic and health implications. To understand why they have an upper hand over traditional pools, we need to understand how saltwater swimming pools work. Saltwater pools essentially contain chlorine. This makes you wonder what makes a saltwater pool different from the traditional pools. The main difference is the way the chlorine is added. In traditional pools, the chlorine is added manually. Saltwater pools operate on a different concept. Here the addition of chlorine is an ongoing process. While this may sound difficult and tedious, the process is actually simple since a regenerative process is used to create chlorine and ensure that it is continuously added into the pool water. Previously, the use of saltwater pools meant that the pool owner had to purchase and transport loads of chlorine. Storing this chlorine was both time consuming and costly. Don’t get us started about the actual cost of the chlorine itself. The process of adding chlorine to the pool was another process that consumed both time and energy. Today, the process of ensuring that your saltwater pool is chlorinated is really simple. Converting a traditional pool to a saltwater pool is a simple two step procedure. The first step involves the conversion of all the pool water to salt water. While most people think that a saltwater pool mirrors the salt concentrations of the sea, they are quite wrong. The actual salt concentration of the pool is anywhere between 1/10th to 1/12th that of seawater. This makes the salt concentration in the pool water extremely mild. The salt that is used in the process is Sodium Chloride (chemically known as NaCl). It comprises of one part of sodium and one part of Chlorine. This part of Chlorine is extremely useful in the entire Chlorination process. The second step involves the installation of a chlorine generator. This chlorine generator is attached to the pools filtration system. The chlorine generator acts in sync with the filtration system. As the water flows through the filtration system to be purified, the chlorine generator works to add chlorine into the pool water. It does this by a simple method of electrolysis. When electrolysis is applied to the pool water as it passes through the filtration system, a simple chemical reaction takes place. The sodium chloride splits into its native elements (i.e. Sodium and Chlorine). In its native form, Chlorine is a gas. This gas dissolves in the water and chlorinates it. The entire process is reversible. This means that the Sodium and the Chlorine which has split into their native forms will eventually combine to for Sodium chloride once more. This Sodium Chloride will once more be used to chlorinate the water. Another thing that you should keep in mind is that the release of chloride ions into the water changes the pH of the water. As the chlorine rises you will notice that there is a subsequent increase in the pH which is directly proportional to the amount of Chlorine released. To maintain the pH at optimum levels many systems automatically release carbon dioxide or hydrochloric acid into the water. This helps to neutralize the rising pH. Video | How Does A Salt Water Generator Work? A saltwater pool need not always be a Chlorine pool. If you replace the Sodium Chloride with Sodium Bromide, you land up with a Bromine pool. The reaction that takes place during electrolysis is essentially the same. This time however, Sodium Bromide splits into its native elements (i.e. Sodium and Bromine). A large difference however exists between Chloride pools and Bromide pools. The difference is essentially because Bromine is effective only as a sanitizer. This means that an additional additive needs to be added so that the oxidative work of Chloride is covered. Due to this major difference, most people prefer saltwater pools that use Sodium Chloride as their base. They are easier to maintain and the Chlorine generator is easier to operate because there are no additional factors that you need to keep in mind. The first and foremost difference between saltwater swimming pools and other pools is obviously the salt content in the water. While this may seem like an innocuous change, the salinity in the water reduces the level of microorganisms by almost more than 99 percent. This however isn’t the only way in which the saltwater makes our lives easier. The reduction in the microorganisms in turn leads to the reduced need for the traditional chemicals. The exposure to chemicals on a long term basis is always harmful. It’s immediate effects are usually seen on the skin. A reduction in the chemicals makes our skin less susceptible to allergies and irritations. That makes saltwater pools a boon to those who have extremely sensitive skin. Since salt water pools do not have chlorine added in as a chemical compound, the chlorine in the pool tends not to be as harsh. This means that saltwater pools cause a decrease in the incidence of red itchy eyes and dry brittle hair. Use these numbers to achieve balanced pool chemistry. The Chlorine in the water has the power to oxidize (and by oxidize we mean kill) harmful bacteria, viruses and even algae. This makes the saltwater pools easier to manage in terms of sanitization and hygiene. Did you know that the effect of pool chemicals on a child’s health is five times more hazardous than that of second hand cigarette smoke? This is what has caused a number of people to start the change. Saltwater pools help to protect our health and the health of the future generation too. Low maintenance is one of the primary benefits that most saltwater pool owners boast off. Saltwater pools literally clean themselves. Since the chlorine generator does the job of converting the salt to chlorine, you don’t even have to worry about the chlorine levels. That in turn also means that you don’t have to worry about the sanitization of the pool. The salinity of the water prevents algae from growing rapidly. This means that your pool will not turn green overnight if you don’t clean it. The interesting part about the saltwater systems is that they can be used for almost any body of water. The limitations however depend on the size of the water body. A good example of a small ecosystem is a hot tub. These same saltwater systems can even be used in large commercial pools. Saltwater systems are easy to install and can be installed by almost any homeowner. This is just one of the things that makes them so versatile. Let’s take a look at one of the popular chlorine generators, namely the Aquapure EI! The AquaPure is efficient, innovative, easy-to-use and worth the investment. For pools up to 35,000 gallons (120V/240V hard-wired). Automatic reverse polarity reduces calcium buildup. Ingenious two-piece locking clamp design. LCD display and LED indicators make info accessible. WEIGHT: Power Pack : 7 lbs. / Electrolytic Cell : 2 lbs. The Jandy AquaPure Ei is a product manufactured by Jandy; a company with a reputation for providing products that are innovative, user focused and durable. The Jandy team of experts works together to ensure that the products are both durable and energy efficient. This is what makes the AquaPure Ei a perfect example to discuss. This model (AquaPure Ei APURE35) is considered to be the newest innovation that Jandy has to offer. Jandy is a leader in pool and spa industry and they own an impressive lineup of famous brands, including: Polaris, Jandy, Cover-Pools, and Baracuda. What’s in the Box of the Jandy AquaPure Ei? While the Jandy AquaPure Ei is easy to operate, the feature that sets it aside from other chlorine generators is its ability to chlorinate a pool in under 15 minutes. This means that this particular model boasts of speed and efficiency. The question that plagues our minds however is, how does the AquaPure Ei manage to provide such a low down time? As described before, the process of chlorination requires the addition of salt to the pool. A single addition of salt is enough for the AquaPure Ei to sanitize the pool all year round. The salt remains enough to sustain the process. This is because after each sanitization round, it reverts back to its original form. This then forms the basis of the next sanitization cycle. Durability has always been a cause for concern in almost all Chlorine generators. The reason for this is related to the high maintenance costs which occur due to the accumulation of calcium deposits. AquaPure Ei has found a novel way to combat this problem. The device comes equipped with a function called automatic reverse polarity. This function helps to reduce the buildup of calcium that takes place over time by performing a self cleaning cycle every few hours. This reduces the cost of maintenance and also prolongs the life of the machine. The Jandy AquaPure Ei is renowned for the ease at which it can be installed. This is one device which works well as a ‘Do It Yourself’ or ‘DIY’ project. So if you are interested and motivated, all you need to do is follow three simple steps and the installation will get done in a jiffy! Click image for full installation diagram. The patented design just requires a few holes (that you need to drill) and a few screws that you need to turn. The design of the AquaPure Ei is very compact. It comes with a quick fit clamping system. Once it is attached to the filtration system of your pool, the AquaPure Ei turns your traditional (manual) Chlorine pool into a safe saltwater pool. At the end of the day, all you need to do is drill, screw and clamp. These are three simple skills that almost everyone has. This makes the AquaPure Ei extremely user friendly. If you already have an old Chlorine generator in place and you want to replace it with the AquaPure Ei, you don’t have to worry about the installation. The AquaPure Ei will fit onto your existing plumbing. This means that you don’t have to make any radical changes. 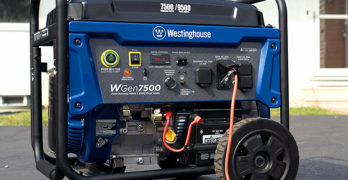 In fact, you don’t even have to remove your old generator! You can mount the AquaPure Ei alongside the old Chlorine generator. You however need to ensure that you disconnect the old Chlorine generator from its power source. Once the installation is complete, plug in the Jandy AquaPure Ei and get started. Having a menu to operate a Chlorine generator is a give in but sometimes the menu is more complicated than necessary. The AquaPure Ei comes with a simple and intuitive menu control which makes operating the device extremely easy. The menu has two basic settings, the clock and the timers. While initially this may sound like one and the same thing, it is in fact very different. The clock determines the time at which you want the device to switch on and the timers determines how long the machine will operate. Once you adjust these settings according to your liking, add the salt that is required into the pool water. It usually takes nothing more than fifteen minutes for the AquaPure Ei to get up and running. After that? Well, after that it is safe to use the pool because the device has already started doing its work efficiently. Now there are many factors that can affect the chlorination process. These factors can be weather conditions like rain or an increase in the number of people using the pool. All you have to do is touch a button to make the requisite changes. Worried that you may get it wrong? Don’t be! The Jandy AquaPure Ei with a control panel feature which will warn you in case anything has gone awry. AquaPure Ei functions by using a base salt compound called Sodium Chloride. Jandy however provides certain specifications that need to be followed when incorporating the salt into the pool water. According to Jandy, the purer the form of salt that is used, the better the outcome and the functioning of the Jandy AquaPure Ei will be. Their recommendation states that you should use salt that is 99.8 percent pure. Now this salt goes through a varied process before it is delivered to you. The key to knowing whether the salt is pure lies in the following words. If these words are present anywhere on your salt label, then you can be assured that it is pure. Another thing that you should look for is if the salt is mixed with caking agents like sodium ferrocynanide. This additive is the culprit that causes discoloration to your fittings and even to your surface finishes. So avoid salts with these additives at all costs. Remember that sodium ferrocyanide goes by many other names such as YPS or yellow prussiate of soda. So keep an eye out for these alternate names too! Some people use water conditioning pellets as they find this easier. Water conditioning pellets are nothing but compressed evaporated salts. If you decide to use this form of salt, remember that it may take longer than usual to dissolve. Another very important aspect that you should keep in mind is that the Jandy AquaPure Ei uses Sodium Chloride as its base. This means that it should not be supplemented with any other chloride compound. Do not try to substitute it with Calcium Chloride. Calcium has a tendency to form deposits in the device. While the device does have an automatic reverse polarity, it will be no match for the large loads of Calcium that it will be subjected to if you use Calcium Chloride as the base. Rock salt too should not be used. This is because rock salt contains a number of insoluble impurities that are mixed within it. Not only will this dirty the pool water but it will also shorten the life of the unit. How Much Salt Do You Need To Add? This is a question that plagues most people’s minds. How much salt is too little? And how much salt is too much? Jandy gives a great way to resolve this situation. In fact, it goes so far as to lay down the guidelines for its own device. This is extremely helpful as it helps prolong the life of the device in use. Let’s take a look at some of the guidelines. Test the salinity of the pool with a reliable method like salinity strips or a salinity meter. The recommended guideline that is set by Jandy is 4,000 ppm of salt. It is wise to remember that too low salt levels and too high salt levels can both cause problems. No need to guess your pool chemistry. If the salt level falls below 3,000 ppm it will result in premature failure of the device. This is something that you want to avoid at all costs. The tendency is to avoid it by being very free with the amount of salt that we add. This however is not the right way out. Be cautious while adding salt as it is easier to add more salt and it is very difficult to remove the salt once it is added. Salt levels higher than 6,000 ppm can cause damage to your pool fixtures. This damage is caused due to the corrosive action of the salt. It is similar to the damage that many houses incur when they are situated to close to the salty air of the ocean/sea. Jandy is very systematic when it comes to its instructions. The AquaPure Ei comes with its own set on set of instructions. Some of the most important instructions revolve around the procedure of adding salt into the pool water. Jandy goes so far as to give a step by step procedure to ensure that everything is in order and that the device runs smoothly. Step 1: Turn on the pump that circulates the water. Step 2: Turn the power of the AquaPure Ei off by pressing the on/off switch. This is a very important step. Ensure that the power is off before you proceed to the next step. Step 3: Test the water salinity. Step 4: Determine the amount of salt that needs to be added. Be conservative and add a little salt at a time. Step 5: Ensure that you brush the salt into all corners of the pool. Do not use a skimmer or a main drain or a surge tank. Keep the water circulating through the filter system for around 24 hours. This helps ensure that the salt is evenly distributed. Step 6: Verify the salinity of the water after 24 hours. Step 7: If you find that the salinity is correct then turn the power back on and start up your AquaPure Ei. The process of changing your traditional Chlorine pool into a saltwater pool is a simple one if you have the right knowledge and the right gadget. Even when you have the right gadget, you need to ensure that you read the instruction manual carefully. While the transitioning period may seem intimidating, it will get over quicker than you realize and you will soon find yourself enjoying the comforts of your new saltwater pool! Available in hard-wired or plug-in models. Automatic input voltage sensing for optimum performance. Titanium electrode blades with precious metal coating for ultimate durability. Electronic water sensor for electrode protection. Watch a video on how the Jandy AquaPure Ei works (Jandy site). FOR YOUR SAFETY: This product must be installed and serviced by a professional pool/spa service technician. The procedures in this manual must be followed exactly. Failure to follow warning notices and instructions may result in property damage, serious injury, or death. *Improper installation and/or operation will void the warranty. It’s important to have a professional install the chlorine generator because as stated above, if the AquaPure Ei is installed incorrectly then your warranty will be voided. Obviously you don’t want this to happen so I recommend paying the money to get it done right. The power pack must be be installed at least 5 ft. (1.5 m) vertically off the ground. The cell must be installed on a 1 ⅓ ft. (0.4 m) horizontal length of pipe after the heaters, pumps, and filters, as the last piece of equipment in the circulation plumbing system just before the pool. The cell must be installed no more than 15 ft. (4.6 m) from the power pack. Here are a few other good options you may want to consider. It’s always helpful to compare competitive products in order to make the right buying decision for your needs and budget. Popular chlorinator with a long history of satisfied customers. 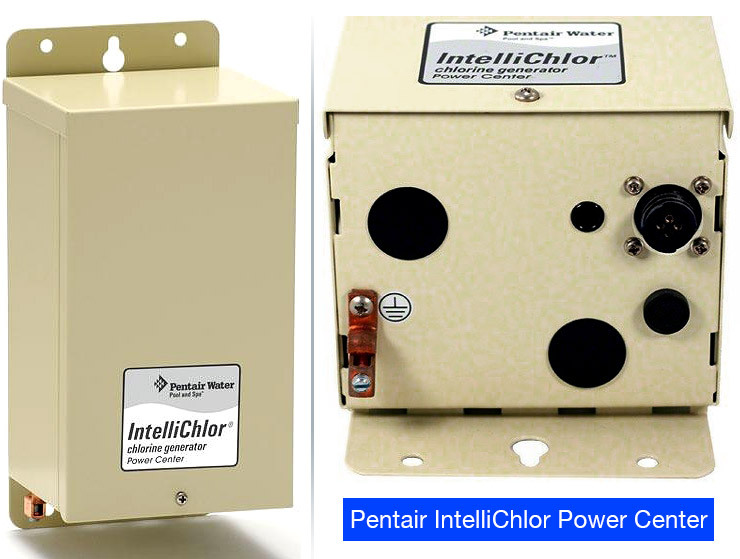 ✓To learn more, read our in-depth review on the IntelliChlor IC20 and IC40. Ability to communicate with IntelliTouch, EasyTouch, and SunTouch Automation Systems. Click image to see large diagram. blades and ten bi-polar blades, five on each side of the center terminal blade. Will supply ample chlorine for almost any residential pool. produce the equivalent of 0.22 kg (0.70 pounds) of pure chlorine per 24 hour period. Uses two terminal blades and five bi-polar blades. IC60 model produces up to 2 lbs of chlorine per day. IC15 produces up to 0.60 lbs. of chlorine per day. PC 100 (P/N H-52-0883): Power Center Kit. Provides power and control communication to and from the IntelliChlor cell. PC 100 (P/N H-52-0883): Power Center Kit. For use with the intellichlor salt generator. Connects to your pool circulation pump. Converts AC electrical current to low voltage DC. Also fits EasyTouch Non-Salt, SunTouch pool and spa automatic control systems. Provides power and control communication to and from the IntelliChlor cell. Size: 6″ length by 7″ height by 12″ width. The MANUAL is packed with technical information so if you want the nitty-gritty details then view this thorough document. The IntelliChlor Power Center converts AC electrical current to a low-voltage DC electrical current which is required to produce chlorine. The power supply is connected with the pool circulation pump electrical source so that the IECG only operates when the pool pump is on. The Power Center is comprised of the transformer, fuse, cell connector and the AC electrical current wiring with the DC electrical current output cable to the IECG. Eliminate red eyes, itchy skin, or harsh odors with this system. NOTE: Hayward does not recommend using the AquaRite to generate bromine. Eventually the cells will need replacing. If you’re looking for a replacement chlorinator T-cell use the links below. *The Extended life cell provides 25% greater total chlorine output over its lifetime than the leading Hayward T-Cell-15 Turbo Cell. A teaspoon of salt per gallon. Salt won’t wear out or evaporate. It’s reused. Creates comfortable water that won’t irritate you like typical pools. Never mix, measure, carry or store chlorine ever again. Save money — an automatic chlorinator saves you money on chlorine. Plugs into any 120V GFCI-protected outlet. Pre-wired for fast electrical connection. View or download the MANUAL for the AquaRite series. View or download the BROCHURE for the AquaRite series. The Hayward AquaRite series is designed for convenience for your swimming pool as it is pre-wired for fast (and easy) electrical connection. It plugs into any 120V GFCI-protected outlet to ensure reduced installation time and costs. Unless required by local code, AquaRite 120 can be installed without having to spend extra money to hire a certified electrician. The AquaRite is an automatic chlorine generation system for pool or spa sanitation. The operation requires a low concentration of salt (sodium chloride) in the pool water. These levels are low enough that it normally will not be tasted. The AquaRite automatically sanitizes your pool by converting the salt into free chlorine which kills bacteria and algae in the pool. Chlorine will revert back to sodium chloride after killing bacteria. These reactions will continuously recycle virtually eliminating the need to add sanitizing chemicals to your pool. The only time you may need to add more salt to the pool is when water is replenished due to backwashing, draining, or splashing (not evaporation). The Hayward AquaTrol series is designed especially for above-ground pools. It’s an important distinction that inground pools and above-ground pools require their own specialized equipment. They are often not interchangeable. A chlorine generator creates healthier water for your family. For example, you can’t simply buy any pool heater and expect it to work with your above-ground pool. You have to do your research and make sure that it’s compatible with the type of swimming pool you own. Luckily, we love research here at Chainsaw Journal so we do our best to provide as much information as possible in each article. 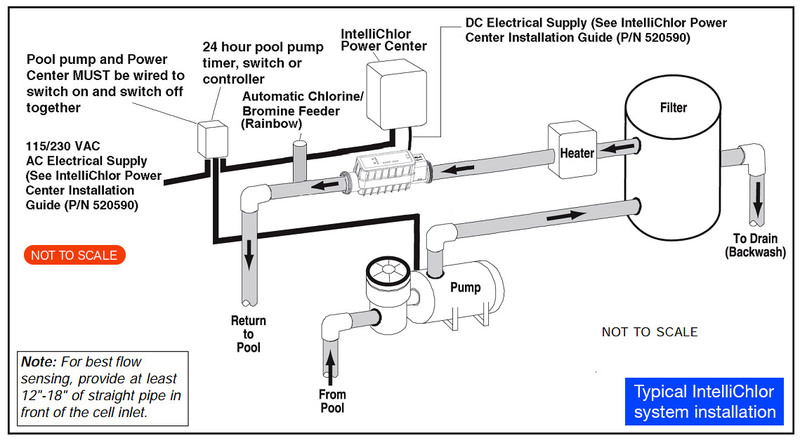 In this case, a chlorine generator is categorized for either inground or above-ground pools. The Aqua-Trol has all the very same features and functionality of the AquaRite (for inground pools) but with a reduced chlorine output. Chlorinator for your above-ground pool. Fast and Easy 30 minute installation. Premium quality water. Soft silky feel. Eliminates red eyes or dry skin. Digital salt display and 7 diagnostic indicators. Automatically cleans the cell by periodically reversing polarity. Patented Turbo Cell for maximum efficiency and flow rate. The AquaTrol is contained in a rain-tight enclosure that is suitable for outdoor mounting. The control must be mounted a minimum of 5 ft. (2 meters) horizontal distance (or more if local codes require) from the pool. The control is designed to mount vertically on a flat surface. Because the enclosure also acts as a heat sink (disperses heat from inside the box), it is important not to block the four sides of the control. Do not mount the AquaTrol in a panel or tight enclosed area. The pool’s chemistry must be balanced BEFORE activating the AquaTrol. The cell and flow switch (not used on -RJ systems) are plumbed in the return line to the pool. Install after (downstream) all the pool equipment (filter, heater, solar, etc.). The kit included in the Aqua Trol provides the necessary plumbing components for either 2″ (51mm) rigid PVC piping installation or 1½ – 1¼” (38-32mm) flexible hose installation. An overview of the AquaTrol system with the hose/pipe installation. Go Natural : Traditional packaged chlorine is a dangerous, unstable, hazardous chemical. Max. pool size: 15,000 gal (56,800L). 110-120V with GFCI (Ground Fault Circuit Interrupter). Requires a filter pump with a flow rate between 700-3,000 gph (2,650 – 11,355L/hr). 1200 GPH | Pump flow rate of 1,200 gallons per hour, ideal for small above ground pools. Learn more about this product on the INTEX site. They have an extensive Question and Answer section. If you need an small above ground pool this set has everything you need. This Intex Ultra Frame Pool Set (16 feet in diameter x 48-inches high) is an excellent value which includes absolutely everything you need to start having some fun in your very own silky smooth saltwater swimming pool. All you have to do is supply the water. If you’re going to invest in a swimming pool it’s best to get it early in the season so you can take advantage of as many sunny days as possible. Perfect for your growing family. The kids will absolutely love this pool. Ready for water in 45 minutes. Includes instructional DVD to help you set it up quickly. Convenient drain plug connects to any traditional garden hose allowing water to be drained away from pool or house area. Improved dual-suction outlet fittings improve water circulation resulting in better water hygiene and clarity.